…at least it might turn out as such for Caucasian Molokans. Their number in the South Caucasus is dwindling so rapidly, that within the next decade hardly anyone of them might be left here. Last week (on August 19th) there was the Transfiguration day. 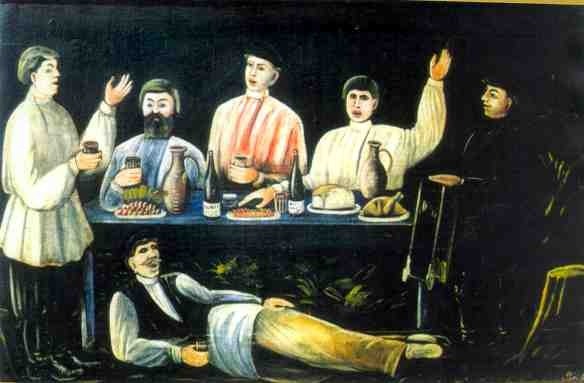 Molokans, as a branch of Christian religion celebrated it too. Journalist Eka Chitanava and I happened to be there to take photos. For me it was quite handy since I was about to start a project on this minority in Georgia. “Don’t be afraid of us, we’re good people,” almost jokingly told me one of the women there. I was about to get surprised on why I should be scared of them, but then recalled the word “sect” and remembered that Molokans were always quite a reserved community. Though they nearly never had problems with local population or fought against governments (“any government is from God,” they say), they never fully integrated into the society and until very recently almost never married outsiders. 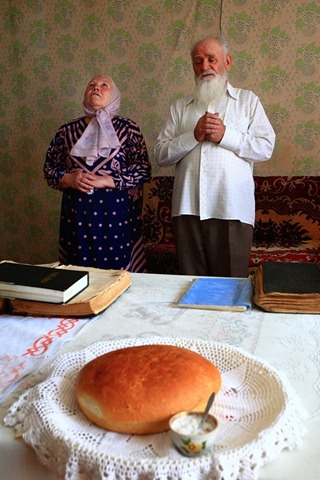 The Molokan religion appeared in Russia of the beginning of 17th century, and, like Protestants, rejected Orthodoxy. They didn’t recognized any visual form of worshiping, like icons, candles and even churches, but only by words, prayers and only from the New Testament. Also, instead of regular prayers they sang texts from the Bible. Word Molokan roots in Russian moloko ("milk"). 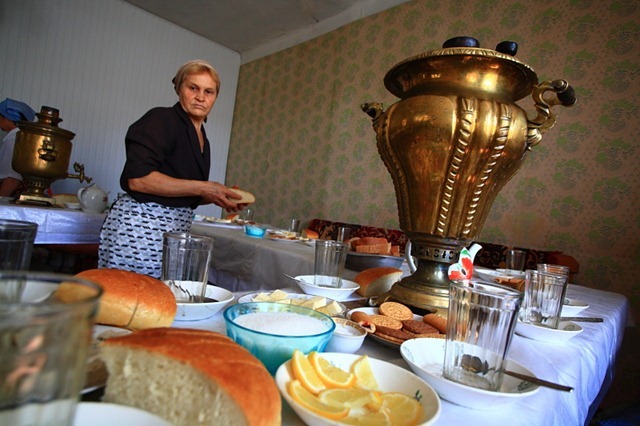 By one of the theories it comes from Molokans’ tradition to drink milk during the period of fasting, but Molokans I’ve met told me it’s derived from the Bible where it is said about "a word, pure as milk." Sent to the South Caucasus in 1800s by Czar Russia, for denying the Russian Church, Molokans settled in Armenia, Azerbaijan and Georgia. 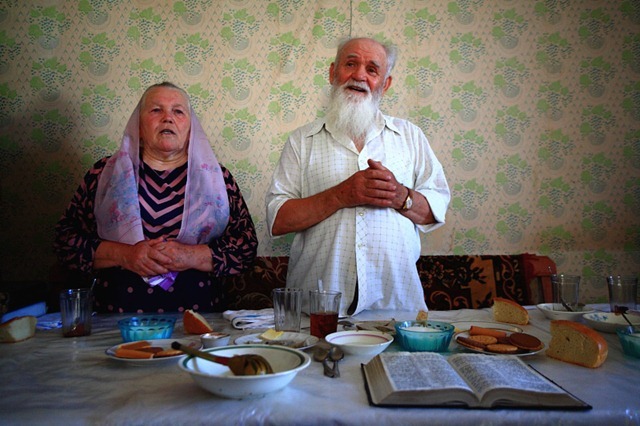 For nearly 200 years Molokans were a feature minority in the South Caucasus region. Adjusting to the new environment and climate (first many of them were sent by the government to hot valleys, which many of them left for cooler middle-height places with lush meadows) they acquired some of the local culture (like cuisine and more intensive cattle-breeding) but also preserved their own culture for decades. 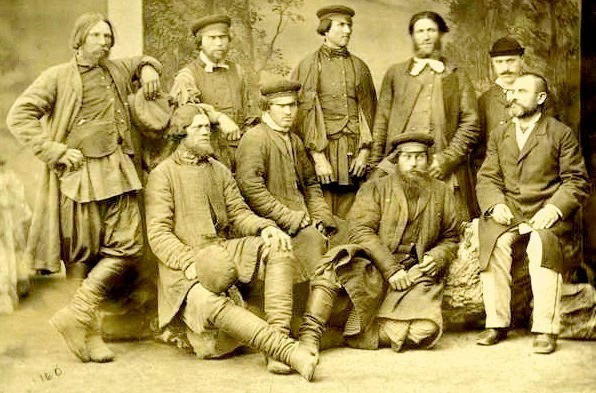 Molokans in Georgia, supposedly the beginning of 20th century. Photo taken from molokane.org. The room is nearly half-full mostly by fifteen women of the age of over 60. Neudakhin proclaims “chant 103” and women start singing the corresponding verse from the Bible. Molokan songs are quite amazing, if sung well, and texts from the Bible sang by pure voices over Russian motifs are impressive. I was told that "all Molokan are born with a pure and strong voice." 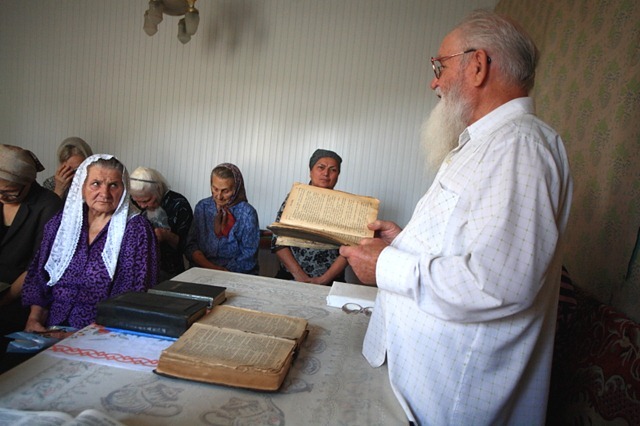 Molokans of Russia singing texts from the Bible. Along with Neudakhin woman-presbyter Lubov Sosina of Navtlughi (a Tbilisi district) Molokan community leads the Transfiguration day celebration ceremony. A woman-presbyter used to be something unheard-of in Molokan communities: women were not allowed to preach. Not anymore. Georgian Molokans lack fresh blood and every knowledgeable and eloquent person familiar with the Bible is worth their weight in gold. Preaching is in Sosina’s blood – her father was also a presbyter – so she was elected by the community that preferred her to her husband. 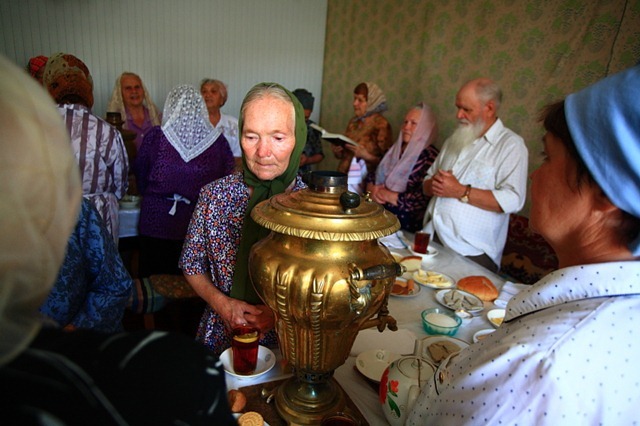 Her attitude towards this is half-playful half-serious: “probably I was more worthy.” According to the presbyter if in 1980s there were around 10,000 registered Molokans only in Tbilisi, now there’s not more than 60 left – virtually none of them younger than 50. 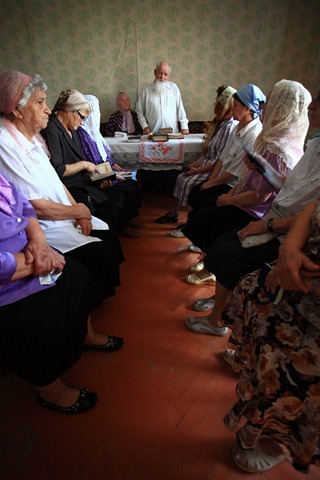 It’s in Molokans’ tradition to allow outsider attending their services to read bible along with them. Eka and I weren’t an exception. During the holiday feast Neudakhin offered me to read some excerpt from the New Testament of my own choice. At the moment Neudakhin said: “when somebody comes here, I let them read from bible. But when I am invited to the other religion’s service, they often make me sit separately from their ‘true believers.’” I chose a several paragraph-long piece from the Book of Ezekiel. While I read women around sighed and nodded. After I finished both presbyters expressed their approval for the excerpt I had chosen. I have to say that the Molokan community I met that day was the picture of hospitality, piety and openness. I liked their attitude towards the God, people and other religions. During one prayer Neudakhin said “we must not forget how miserable our faith is. It’s always hard to believe truly. The leaders of all other churches and religions should never forget about that, shouldn’t get vain and be more humble.” So true about many people I see around. However this humbleness and wisdom I often saw in other religious minorities as well. Seems that religion usually works only for minorities. As soon as any religion gets to the power it becomes rather dogmatic with a tendency towards the suppression of dissent. Anyways, Molokans were yet another characteristic ethnicity that formed the multinational society of South Caucasus region. Speaking of Georgian Molokans, with them gone, the state will become a bit less multicultural. Is it something not to be worried about? Molokans singing. A Painting on oilcloth by Niko Pirosmani. Big thanks to Bardzimashvili for documenting this vanishing history and testifying first hand what he witnessed. Thank you for correction! Changed the photo.